Greetings from the Paul M. Hebert Law Center. As this week begins, we are busy getting ready for the fall semester and the arrival of the new class. As I begin my second year back at LSU and as your dean, I am excited about the future, and I want to update you on some of what we have been up to and on what lies ahead. As always, a bright future will depend upon your faith in us and what we do as well as your support. Last year was a very busy one. The faculty, staff, students, and alumni welcomed me with open arms and have done a great (an ongoing) job of teaching me about the LSU Law Center of today. We have worked hard but we have managed to have some fun along the way, and our shared devotion to our students is inspirational. So what did we accomplish last year? 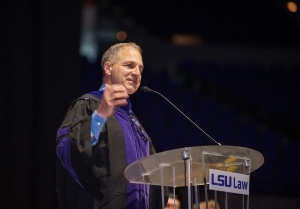 Former FBI Director Louis Freeh delivers the Commencement Address to LSU Law graduates on June 2, 2017, at the Pete Maravich Assembly Center. On June 2, 2017, at the Pete Maravich Assembly Center, we awarded 180 JD degrees and three LL.M.s at commencement. Eleven students earned the Graduate Certificate in Energy Law and Policy. Former FBI Director Louis Freeh was the commencement speaker, and there were happy students, proud families, and many celebrations! We were joined by and congratulated a significant number of alumni from the Class of 1967, our Golden Graduates, who celebrated the 50th anniversary of their graduation. You can read all about it on our website. In addition, we successfully recruited two new faculty colleagues: Lecia Vicente and Raff Donelson. Professor Vicente will teach in the areas of business law and civil law, two areas in which we desperately needed help. Professor Donelson, who holds a JD and a Ph.D. in Philosophy from Northwestern, is a joint appointment with the College of Humanities and Social Sciences and its Department of Philosophy and Religious Studies. Hiring new colleagues is crucial for the Law Center as, over the past 10 years, we have lost a net of 10 faculty colleagues who taught in key areas. This is an important time to be hiring because the pool is very strong and the national decline in law school applications and students means there have been fewer opportunities for great people to obtain employment as law professors. This is a time of real promise for those law schools able to hire. In addition, with the departure of Professor Blake Hudson, our good friend Professor Emeritus Pat Martin, one of the nation’s foremost experts on oil and gas law and regulated industries, will serve as Interim Director of the thriving John P. Laborde Energy Law Center. Professor Ken Levy was promoted to the rank of professor, and Professors Phil Hackney, Maggie Thomas, and Chris Tyson were granted tenure and promoted to the rank of professor. The promotions are effective beginning this fall semester, and they are significant professional accomplishments by each person. In addition, Interim Library Co-Director Natalie Palermo was granted tenure and Interim Library Co-Director Will Monroe was moved to the tenure track. Our new colleagues and our newly promoted and tenured colleagues make us confident that the great teaching, impactful scholarship, and critical public service you all associate with your law school will continue in the years ahead. Last year, we also prepared for and had our seven-year ABA accreditation sabbatical visit. The process is extremely time-consuming and detailed. It entails completing a comprehensive site evaluation questionnaire, preparing a self-study, arranging for the visiting team’s stay, meeting with the team, and more. Many at the Law Center worked extremely hard to prepare for the visit, which we believe was most successful. We look forward to receiving the team’s report and subsequent letter from the ABA Accreditation Committee. The process was beneficial and will offer us the chance to improve. Over the course of the year, the Law Center reviewed and modified its basic governance procedures in several significant areas. The elected faculty Executive Committee will be more active in advising me on matters of compensation, and the faculty created a new Faculty Review Committee to work with me on annual and more extensive five-year performance and planning reviews of one another. The faculty also amended our Tenure and Promotion Committee procedures to require a written annual report to each tenure track or secured position, untenured colleague. This will formalize and improve the feedback to and developmental process for our pre-tenure colleagues. We also amended our Scholarship Grant Program to be simpler, more flexible, and clearer. We implemented a monthly staff breakfast where the entire staff comes together to hear about developments at the Law Center, to learn more about what each area does, and to learn more about LSU and what programs the University has to offer. The subjects we covered included Advancement, Admissions. Career Services, the ABA Accreditation process, Title IX, safety and security (presented by the LSU police), support procedures available to students at LSU, and more. One of the many things that have changed for the better since I left LSU in 1998 is that diversity and inclusiveness are a major priority. We know that if students are not learning in diverse and inclusive classrooms and clinics, they are not being prepared for life in the 21st Century. We are particularly pleased and proud of the work of our Diversity and Professionalism Committee, which planned and held eight panels and other events throughout the year dealing with an array of diversity-related topics. 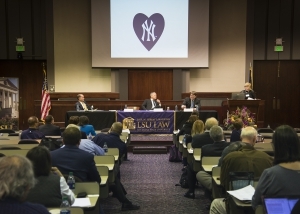 The Louisiana Law Review hosted a symposium on sports law on January 27, 2017, at the LSU Law Center. In addition to the diversity programming, Professor Arthur Miller of the NYU School of Law was the Judge Alvin and Janice Rubin Visiting Professor, and he gave a fascinating Rubin Lecture on the civil justice system in America, and also visited classes during his stay. Vanderbilt Law Professor Jim Rossi was the Liskow and Lewis Visiting Professor in Energy Law. The Louisiana Law Review hosted a symposium on sports law, and the Journal of Energy Law and Resources symposium dealt with the effects of the energy industry on the coastal environment. In March we dedicated Room 106 in honor of Frank Maraist, and in May we dedicated Room W-210 in honor of Cheney Joseph. The dedicated classrooms were the rooms in which Frank and Cheney preferred to hold classes. A couple of weeks ago after walking the Portuguese Way (a medieval pilgrimage) with my wife, one of our daughters, and a friend, I had the chance to visit out summer program in Lyon, France, at Universite Jean Moulin—Lyon III. We have 48 students participating this summer (47 from LSU) with six classes offered. Each class has either an international or comparative aspect to it. Lyon is a beautiful city with the Rhone and Somme rivers running through it. All of the students I talked to praised the program and were grateful and excited to be participating. I could go on and on about the accomplishments of our faculty, students, and staff, but instead I encourage you to visit our web site to see all the wonderful things that are going on and that the LSU Law Center has accomplished. On the admissions front, we continue to face the most competitive environment in which any of us have ever worked. The number of applicants to law school has plummeted over the last few years, and LSU Law is no exception. Our number of applications has declined over the past few years from 1,437 in 2011 to 857 in 2016. Despite the challenges our admissions team — with great help from the faculty and staff — have done a fantastic job of recruiting a class which we believe will be about 180 strong. As of now the class has the same median LSAT (154) as last year’s entering class and a slightly higher median GPA. As of this writing, 70 percent of the entering class are from Louisiana, 54 percent are women, and 34 are students of color. A smaller class means we can be sure we are only offering admission to students we know will succeed at LSU and as attorneys. It is also a good thing because 91 percent of our graduates have been employed within 10 months of graduation in each of the last two years. Our numbers would not be nearly so good if we unrealistically admitted and graduated more people. So smaller really is better, but getting smaller also aggravates our financial challenges. As you know from reading the newspaper, LSU has suffered through 17 budget cuts in the last nine years. Today less than a quarter of our annual budget comes from the state of Louisiana. The rest comes from tuition and fees, and our expenses exceeded our budgeted amount over the last three years by over $1,000,000. In fact, in FY 2018 projections indicate expenses will exceed state support plus tuition and fees by over $2,000,000. What does all that mean? It means that your support is crucial. Our ability to continue to do what we do and to improve depends upon your generosity and support. 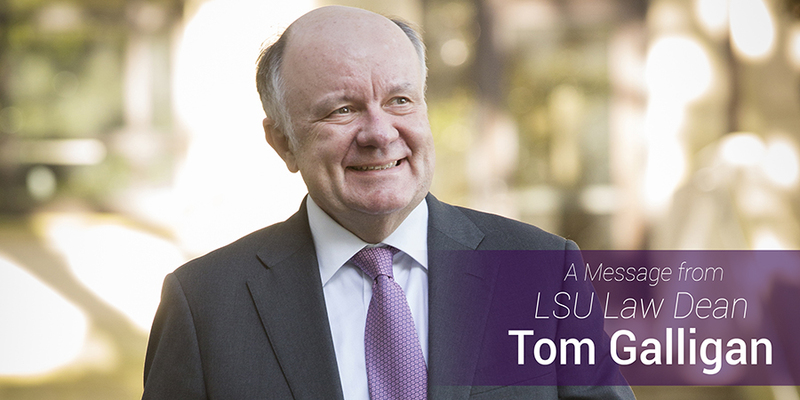 LSU is your law school, and now more than ever, we need your generous support. For the past few years we have been balancing our budget, in part, by using our savings. But our savings are running out. Today, your law school needs your help. So, when we call and write asking you to make a gift to support the Law Center, please say yes. In an upcoming message, I will let you know about some of the things we will be working on in the year ahead and particular projects for you to consider supporting.